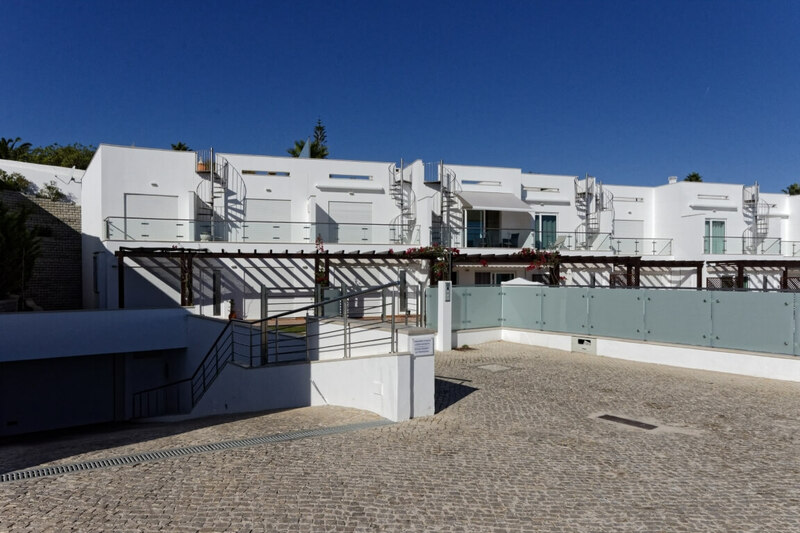 Oasis Praia Carvoeiro Bay is a modern two-bedroom townhouse with fully equipped kitchen. 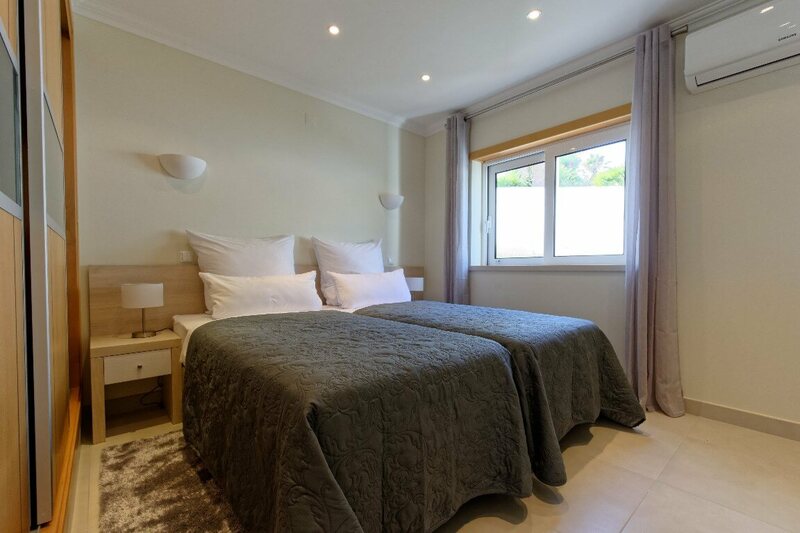 The townhouse is superbly located in Carvoeiro, a traditional fishing village and one of Algarve’s top holiday destinations. 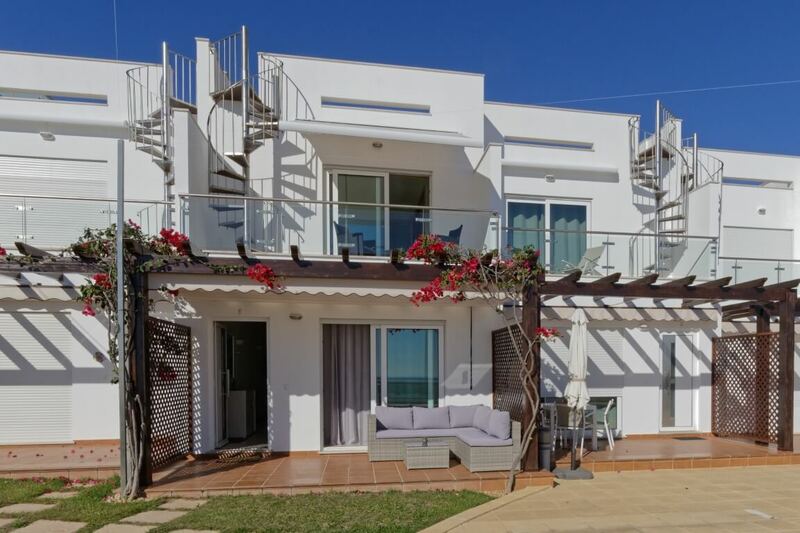 It offers breathtaking sea views of the nearby Atlantic Ocean, which can be enjoyed directly from your own terrace, the living area, the master bedroom, the balcony, the sunroof and the pool area. 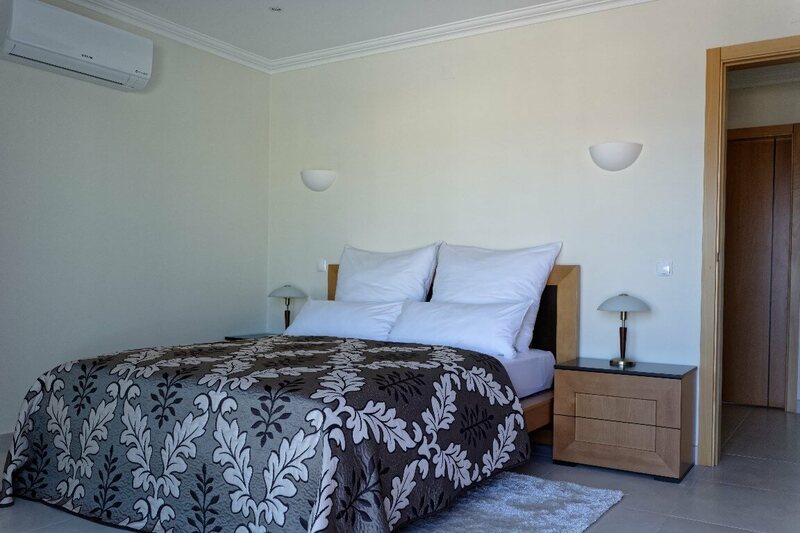 All living spaces feature free WLAN access, air conditioning and heating, and electric shutters. In the underground car park of the facility, two parking spaces are reserved for you. 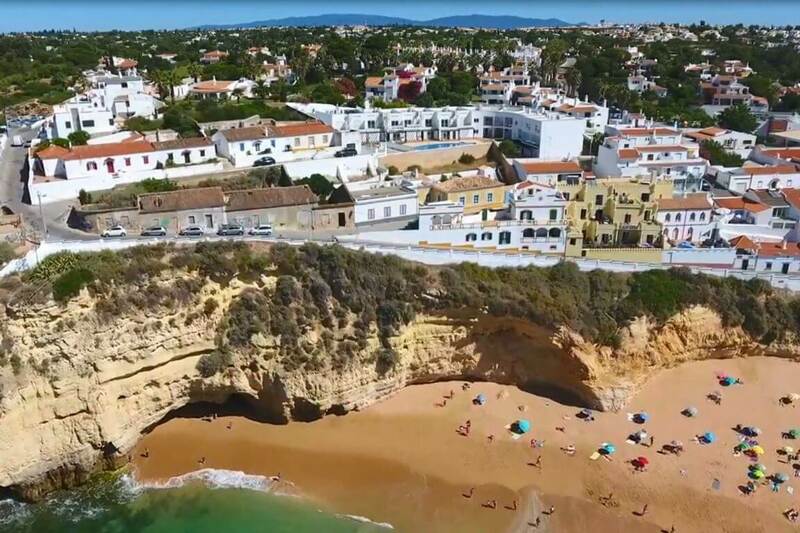 As the facility provides its own shortcut to the Rua do Casino, the well-known Praia do Carvoeiro beach and the city center with its huge selection of restaurants, bars and cafés can be reached on foot after approx. 250 meters. There are plenty of shops in the town for your everyday needs and on the outskirts you will find bigger supermarkets for even more choice. 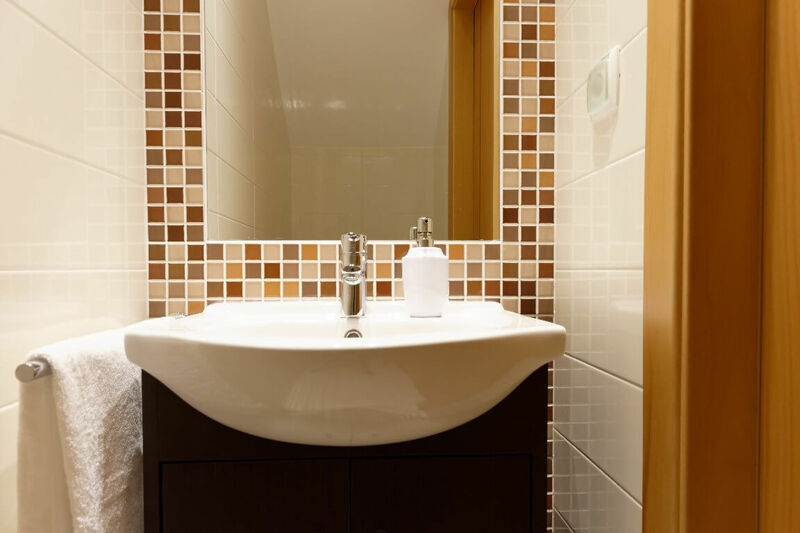 The residential complex is gladly visited by owners and guests from around the world and offers an international flair in a very pleasant atmosphere. 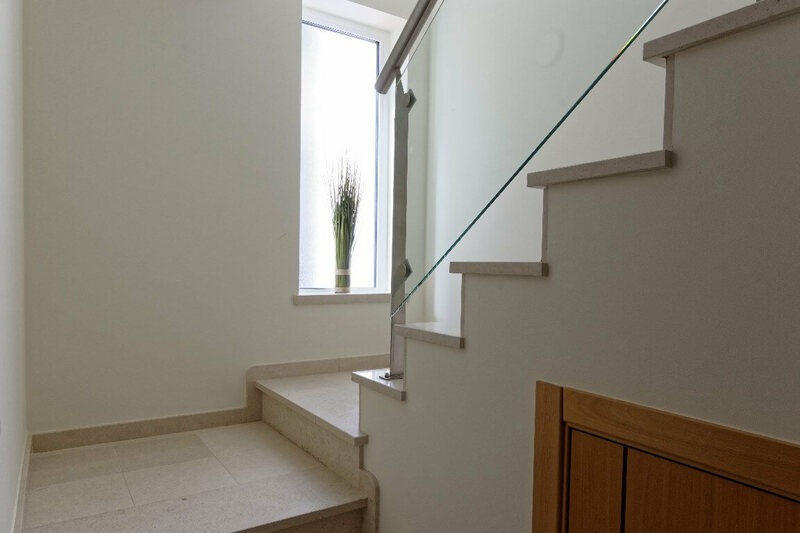 All living spaces feature free WLAN access, air-conditioning and heating, and electric shutters. 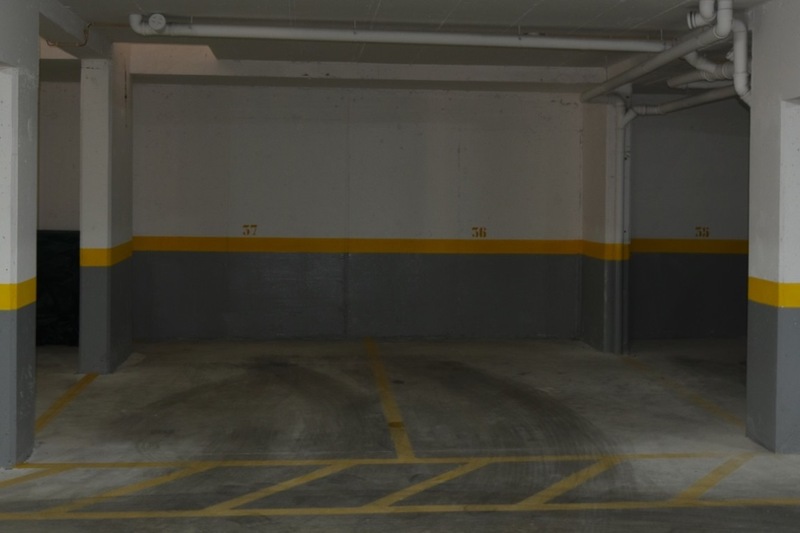 In the underground car park of the facility, two parking spaces are reserved for you. 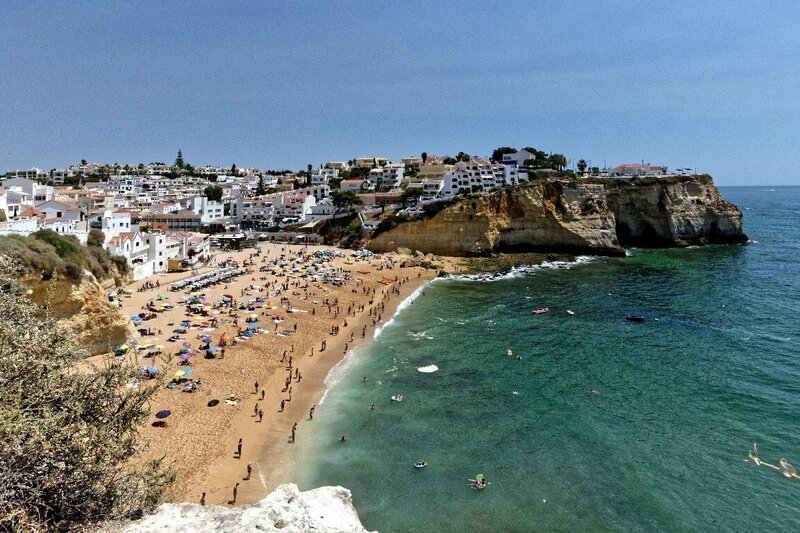 The well-known Carvoeiro beach and the city center of Carvoeiro with its huge selection of restaurants, bars and cafés can be reached on foot after approx. 250 meters. There are plenty of shops in the town for your everyday needs and on the outskirts you will find bigger supermarkets for even more choice. 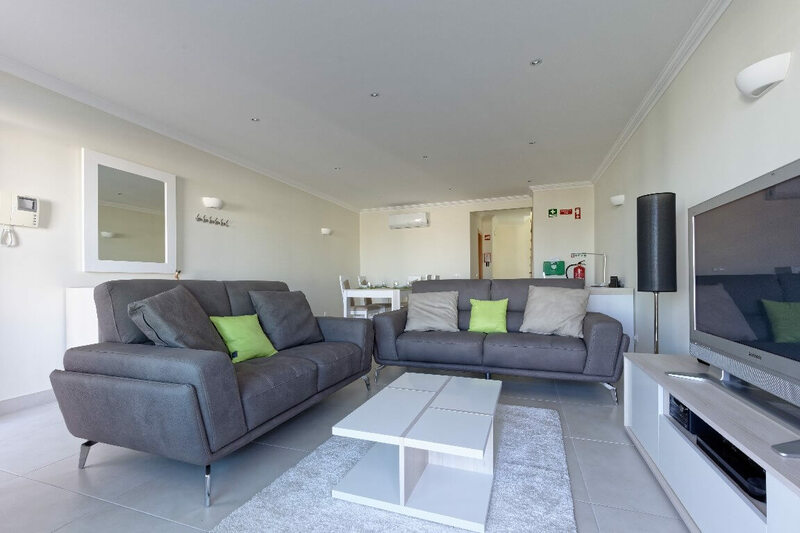 The small residential complex is gladly visited by owners and guests especially from the UK, Ireland, France, the German speaking countries, the Netherlands, Scandinavia and Portugal, and offers an international flair in a very pleasant atmosphere. Drink, wine and champagne glasses, etc. Great location, just 2 mins walk to the beach. 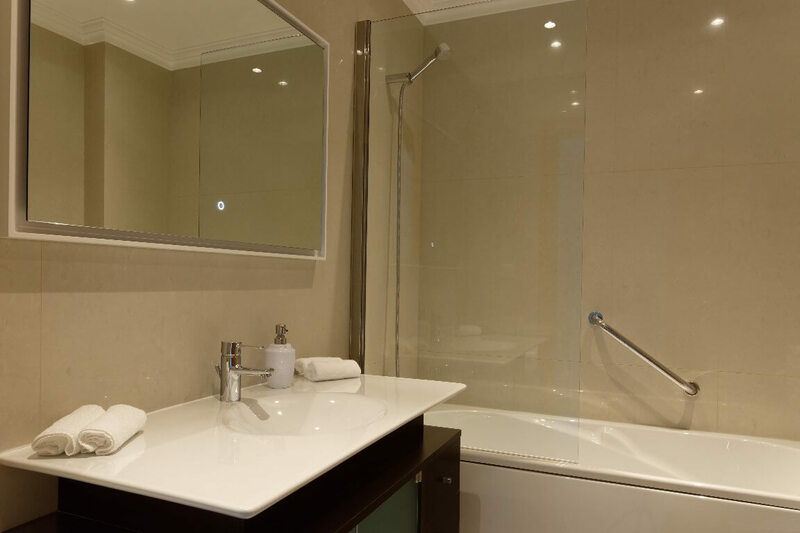 Absolutely spotless clean with all the utensils and amenities provided. 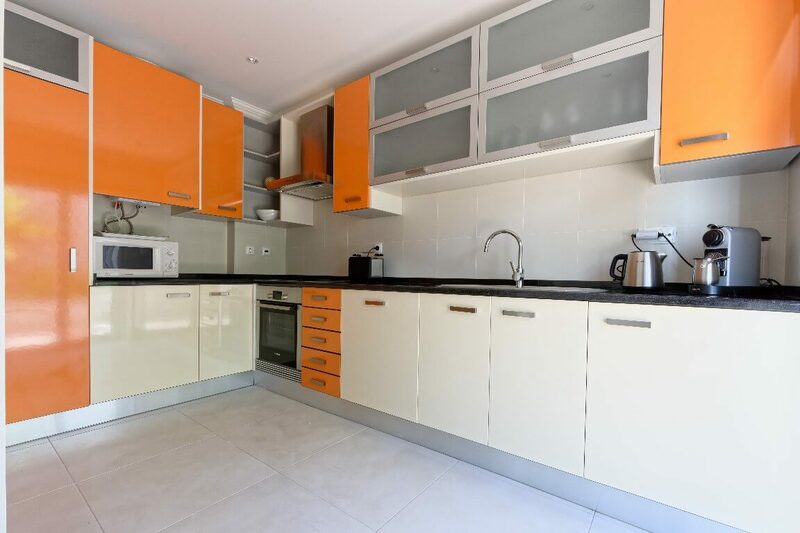 Fabulous modern appliances and very beautifully presented apartment. Fully recommended! A week of relaxation and comfort, everything was perfect. Our hosts Sascha and Nadine were wonderful, they had thought of everything to ensure we had everything we needed for a fabulous time there. 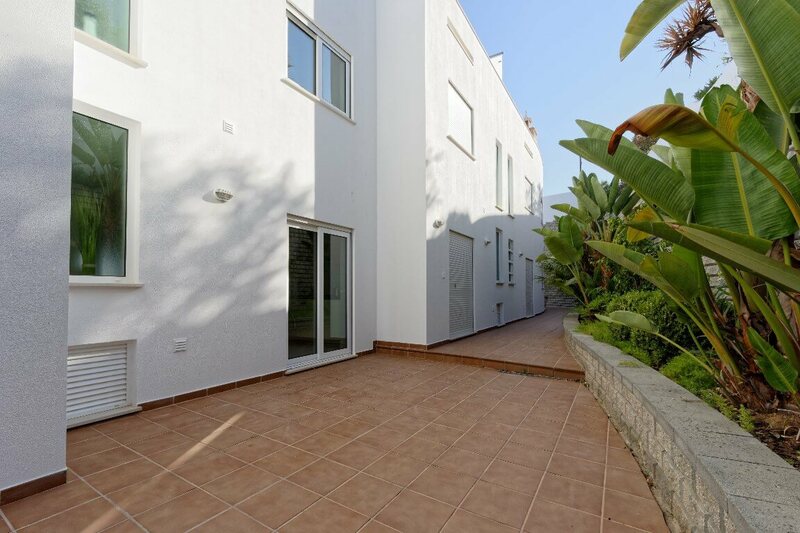 The house is beautifully furnished, modern and spotlessly clean throughout. The kitchen is of top quality and very well equipped. 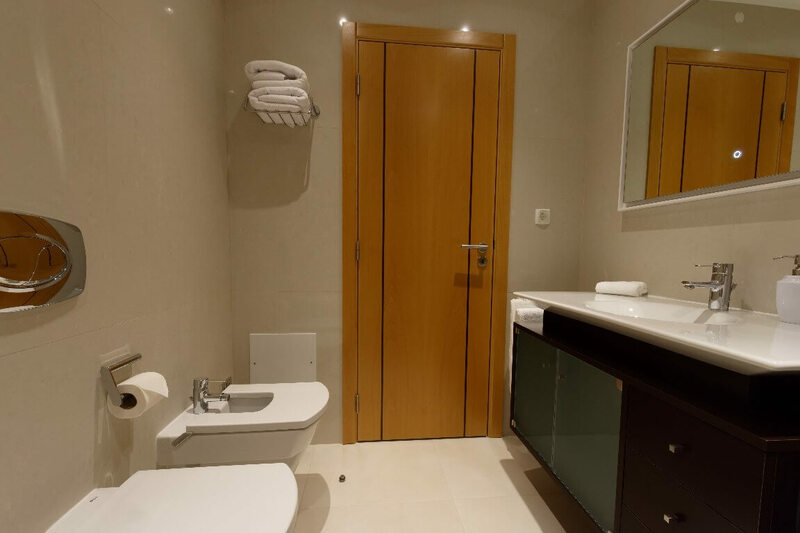 A lovely bathroom with plenty of storage, comfortable beds, soft pillows and plenty of wardrobe space in each of the bedrooms. Lots of helpful information at the property on places to visit and good wifi. 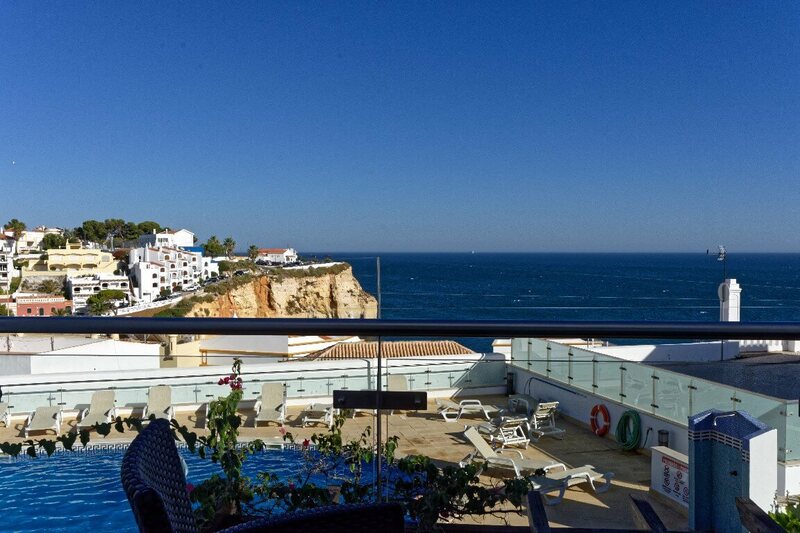 It was lovely sitting on the balcony looking out over the ocean and Carvoeiro, the view is amazing. Very nice pool area with plenty of sun loungers. Very peaceful, no traffic noise whatsoever even though it is in a central location. A few minutes stroll to the beach, shops and restaurants. 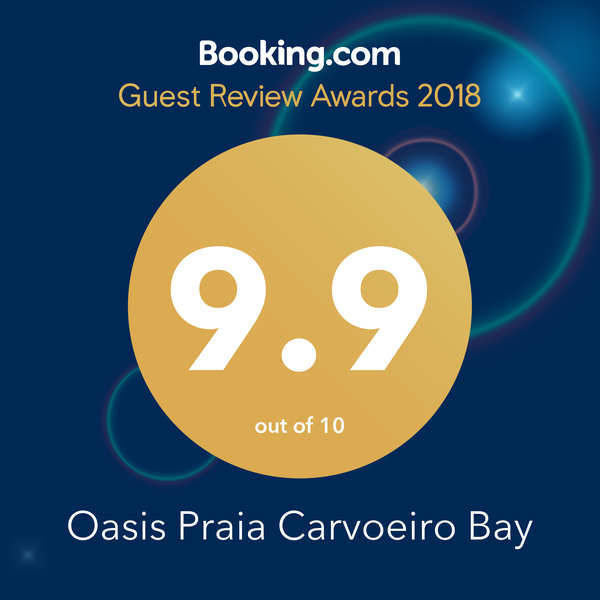 I would definitely recommend staying here and it would be our first choice if we were to return to Carvoeiro. 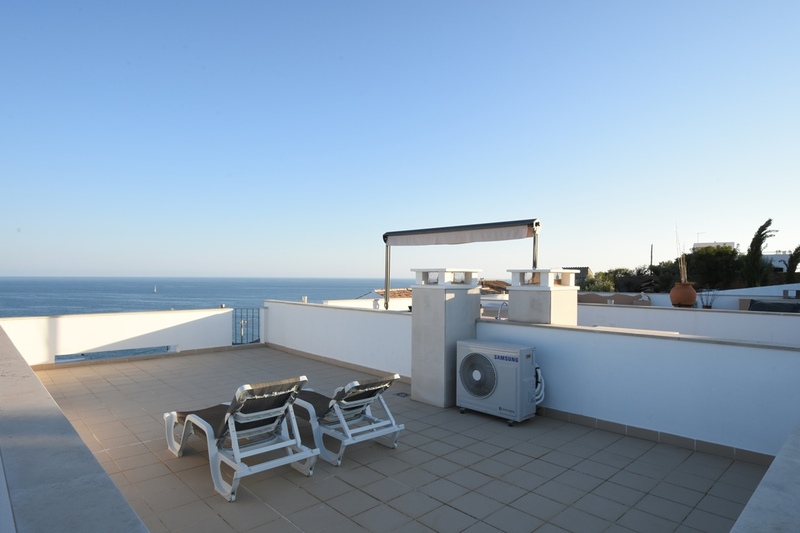 Very nice location and appartment, nice sea view, well equiped, very clean, very nice host. ...what else ? ;-) thank you Nadine and Sascha ! Lovely property in an excellent location with very helpful owners.highly recommend. Firstly, the owners - very friendly,helpful and informative. 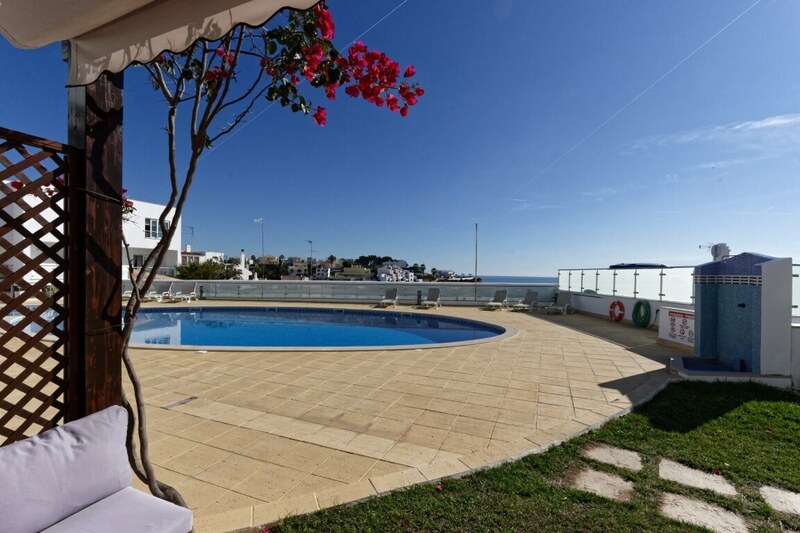 Secondly, the property - knowing carvoeiro we knew that this was going to be a good location and it did not disappoint.really close to town and beach. Lovely pool incl learner section for the kids.plenty of loungers and sun all day.nice and quiet despite proximity to town. 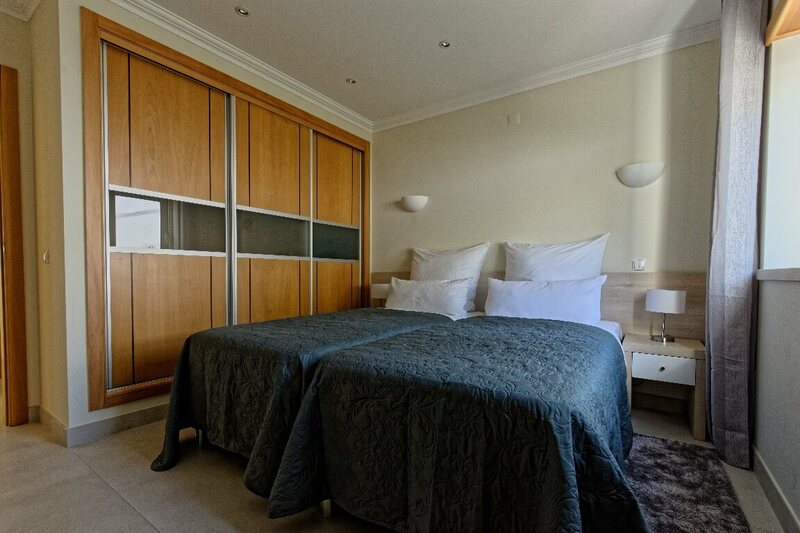 The house was very clean and well appointed.modern kitchen and bathroom,finished to a high standard.air con in bedrooms and lounge was quiet and highly effective.furniture of good quality.secure underground garage a nice touch. I would highly recommend and expect to return.just sorry the holiday had to end. Great location and townhouse was fantastic. Highly recommend. We have been to the area 5 year running know and have actually stayed at the same complex in a smaller apartment. The finishing touches to the townhouse makes all the difference, and was very well appointed. The owner left us champagne, cream , 4 bottles of water, tea , coffee. All the toilets had handwash, plenty of towels, pool towels. The kitchen was fully equiped. I could not say enough about the townhouse, it is definatley 5 star. The location is also perfect. Thank you for a fantastic holiday. Endroit magnifique et splendide, la qualité de nos Hôtes a été exceptionnelle. Nous avons pleinement aimé notre séjour avec la vue la piscine et la proximité de tout...on recommande le tout sans difficulté. Nytt,pent og svært god beliggenhet. Hyggelig eier. God service. Pent bassengområde. Fantastisk utsikt. The modern, tri-level (incl roof) unit is bright and quiet in a spectacular south-facing location overlooking the pool, some tile roofs nearby and the eastern cliff of Carvoeira beach and the ocean. Sun traverses from left to right and can be managed with the unit's retractable shades. Parking is secure and appliances are like new. (Shower enclosure is awkward for older guests (me).) Unheated pool is very nice and was usable in mid May. Nearby restaurants with great views and the town center all are close by. The owners patiently helped us find the place and welcomed us in person. 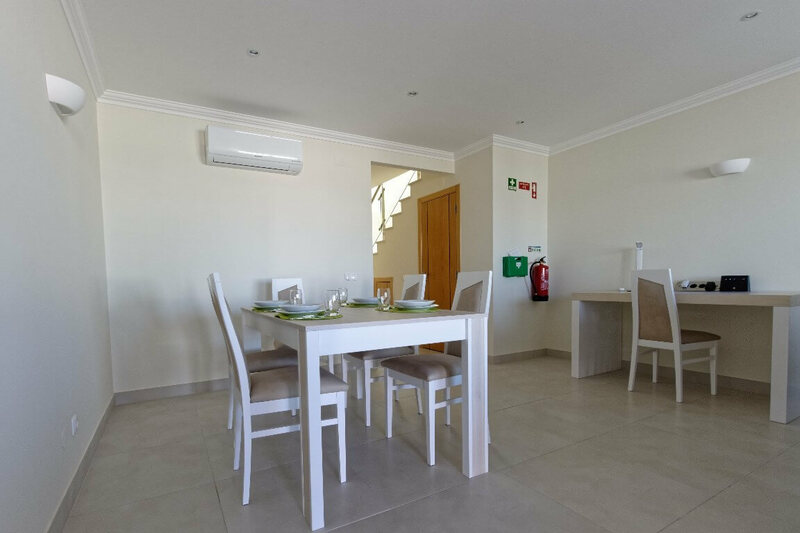 We enthusiastically recommend this unit as a lovely and modern place to stay while exploring the joys of the Algarve area. Absolutely amazing property with the best and most helpful airbnb hosts I have ever had the pleasure of dealing with. The property itself was spotless and had everything you could possibly need. It was furnished to a very high standard and was very very comfortable. We travelled with our 9 month old baby and she found the travel cot so comfortable that she slept like a dream for the whole week we were there...even better than home! The location for us was just perfect, incredible sea views and peaceful with the added bonus that you could walk into the centre in less than 5 minutes. The pool area was very clean with plenty of sunbeds and the pool itself was very inviting. I would highly recommend this property and hope to get back some day. Lovely apartment also nice welcome pack. Very clean. It was better than expected. Good communication with host. From the initial reservation to check in Nadine was the best host. She answered all my questions I had before our stay and even went out of her way to meet us at the condo. The condo was stunning, impeccably clean and the location was amazing. This place is very spacious and we were given a very comfortable cot so all three of our children could sleep in the same room. It was very well equipped and the chocolates, coffee and cream were a really thoughtful touch. She took her time with us while checking in by showing us around the condo and all the amenities it offered, but beyond that (which no host has ever done) she went out of our way to walk us through the short cuts to take us to downtown escorting us to the market and back so we could pick up just a few things. She made us feel very welcomed and cared for and we appreciated all the information she gave us. This was the most personalized attention to detail that any other host has ever offered. 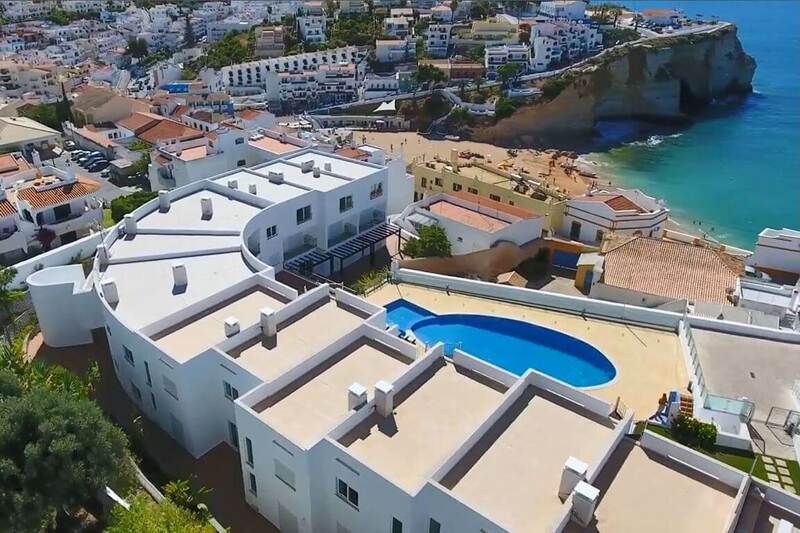 Between the beautiful condo itself, the view and the best Hospitality I would highly recommend staying here and hope to stay again the next time we’re in Carvoeiro!!! Vielen Dank für einen tollen Aufenthalt in eurem Haus und eure Gastfreundschaft mit Tipps und Ausflugsempfehlungen. Euer großes, modernes Haus ist sehr geschmackvoll eingerichtet und bietet allen Komfort, ob Technik oder Haushalt. Die Ruhe und der Blick auf die Bucht sind wirklich einmalig. Besonders gut hat unseren Kindern der hohe Chill-Faktor auf der Terrasse, dem Balkon und der Dachterrasse gefallen. Wir haben die kurzen Wege in das Örtchen und die Atmosphäre sehr genossen. Sascha and Nadine's place is fantastic! We've stayed at literally dozens of different villas, houses, apartments, etc, near Carvoeiro, and this is the best. The views are incredible, the style is cool but also very comfortable, and the house was immaculate. The pictures are nice, but don't really do it justice - it really does have a bit of a 'wow factor' when you see it in person. Sascha and Nadine were brilliant hosts - great communication before the stay, met us to show us around, warm and friendly, very kindly left some welcome treats, etc. I'm trying to think of a fault in order to balance the review, but I can't really think of one... We will certainly be back! Appartement neuf, très agréable et lumineux, décoré sobrement et avec goût. Trois terrasses. Très belle vue sur la baie. Cuisine très bien équipée (tout est de qualité, verres, vaisselles, couteaux, cafetière Nespresso...). TV dans le salon et aussi dans la chambre principale. Lit confortable, beaucoup d'espaces de rangement. Salle de bain agréable. Unique bémol:la connexion internet est lente. Accueil chaleureux de Nadine qui nous a offert une bouteille de vin pétillant pour fêter le nouvel an. Grande flexibilité sur les horaires de check-out (quand cela est possible, naturellement). Замечательные апартаменты. Невероятный вид из спальни на скалы и океан, очень не хотелось бы уезжать от туда, очень чисто, уютно. Большое количество полотенец, в том числе и для пляжа, есть пледы, много разной посуды и много других приятных мелочей. Когда заехали были очень удивлены тем, что в холодильнике стояла вода, был чай, кофе, печенье и даже бутылка шампанского. Парковка находится под зданием. Великолепные хозяева Надин и Саша очень постарались, что бы гостям было комфортно. Апартаменты находятся на склоне, но подниматься не очень высоко по меркам Португальских городков. Мы очень много путешествуем, но такое гостеприимство встретили впервые. Недалеко от апартаментов находятся минимаркеты, но мы ездили за город в крупный магазин, где можно купить полуфабрикаты и готовую еду. Alles war perfekt!Top Ausstattung in allen Bereichen des Hauses (Küche, Bad,...), super sauber, tolle Lage im/zum Ort und zum Strand, schöner Ausblick auf den Ort und das Meer, sehr nette und überaus hilfbereite Vermieter! Es hat uns an nichts gefehlt. Sogar eine liebevoll ausgesuchte kleine Grundausstattung (Gewürze, Kaffee, Tee, Wasser Sekt, Kekse,... und tolle, extra für unsere Tochter ausgewählte DVDs) stand für uns bereit. Wir haben uns willkommen und wirklich sehr wohl gefühlt! Das Haus ist zu 100 % weiter zu empfehlen!!! Relaxing family holiday beside the sea. We loved the location and the townhouse. Our hosts were very helpful and informative even before we arrived. 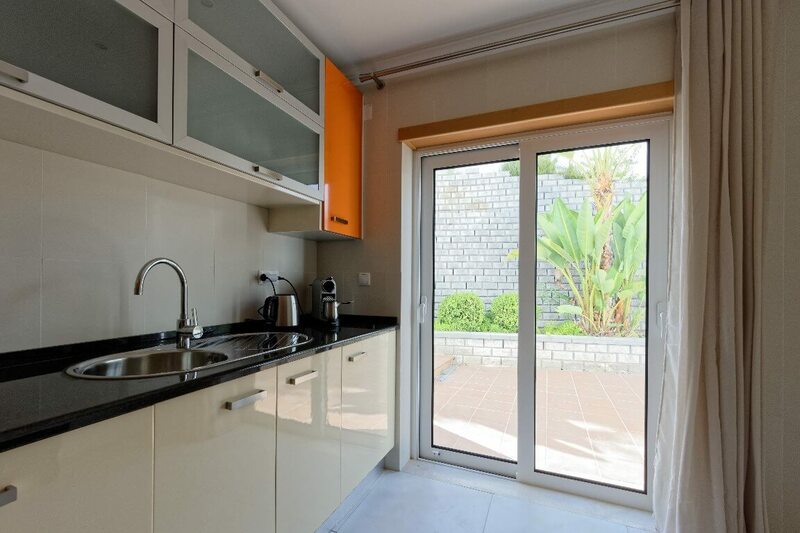 Spotlessly clean, well equipped Kitchen, Pool at your doorstep, 2 minutes walk into town. Quiet and relaxing location. Beautiful sunrises and sunsets out on the balcony. Everything was perfect. Sascha und Nadine waren vom Anfang bis zum Schluss die perfekten Gastgeber: prompte, herzliche Kommunikation, flexible Check-In Zeiten, hilfsbereit, freundlicher Empfang, Extras im Haus wie Wein, Kaffee, Wasser etc. Das Townhouse hat eine super Lage mit herrlicher Ausssicht, ist ruhig gelegen und trotzdem ist alles gut zu Fuss erreichbar. Bei der Einrichtung dachten Sacha und Nadine wirklich an alles und haben mit viel Herz eingerichtet. Wir wären am liebsten länger geblieben und kommen hoffentlich bald wieder! Great holiday, perfect location and great weather. Lovely house, stunning views and the hosts could not have been more helpful. Tea, coffee and biscuits were left with extras which we didn't expect. Spotlessly clean, fluffy bath and beach towels. 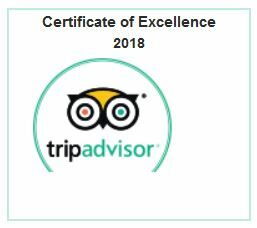 We can't wait to go back - but reviews like this won't help as you will all want to stay here!!! This was only our third holiday but whether it was our 10th or 100th it will be hard to beat. 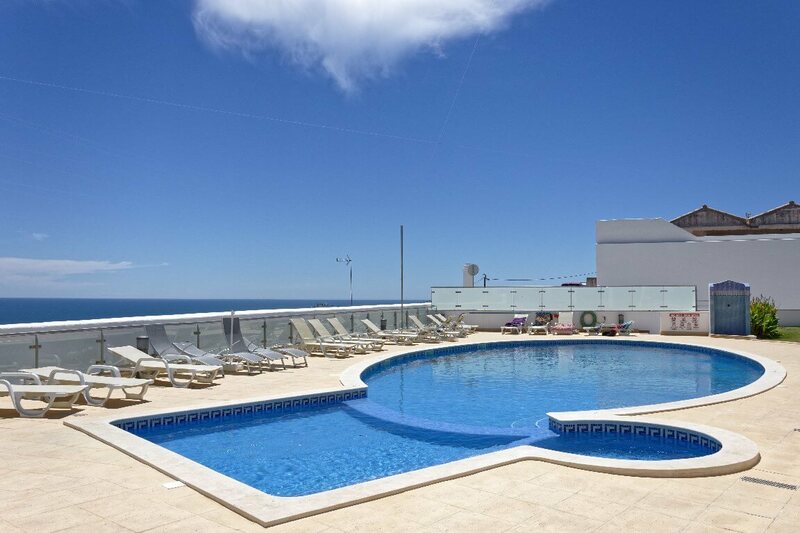 The two floor apartment is spectacular with amazing views of the ocean and town. Sacha and Nadine were amazing to us from start to end. Commication was excellent and the place is outfitted to the nines. They went out of their way to make sure we had water and many extras after our long trek to the Algarve. We only wish we had a few more days to stay. We can't wait to go back and enjoy the place again and more of the area. Thank you Sacha and Nadine. If anyone wants more info please ask. The were truly great. You can't go wrong. 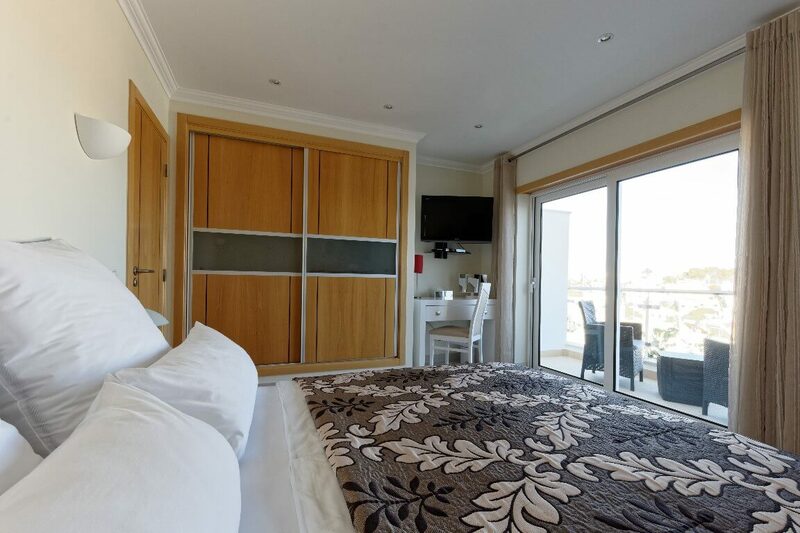 You wont go anywhere else once you have stayed here - defo 1st class holiday accommodation.Best location in Carvoeiro - beautiful sea view, beautiful, modern and clinically clean property with beautiful décor. Having holidayed in Carvoeiro for the past 13 years, weve stayed in many lovely places - this is by far the best place weve ever stayed. The views are to die for and the walk into the centre of the village is approximately 3 mins. I'd have absolutely no hesitation in recommending this lovely townhouse to anyone and we'll most certainly be back again. Our hosts, Sascha & Nadine, were so helpful, thoughtful and kind and every aspect of the property and facilities was well thought out, nothing was left to chance. Unfortunately one of our party was not well on our trip and our hosts were simply fantastic and so kind to us that I really cannot rate them highly enough. The location and the house were great! 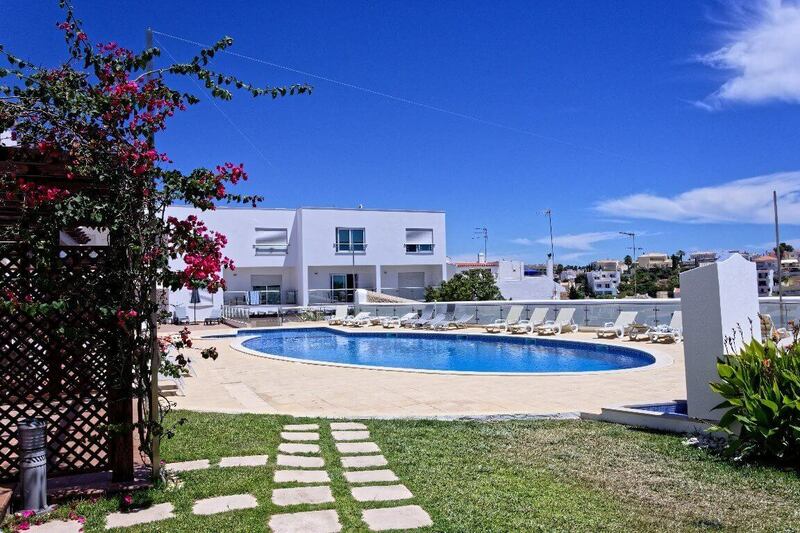 Located right in the carvoeiro heart 5min walking to the beach! We felt like at home! 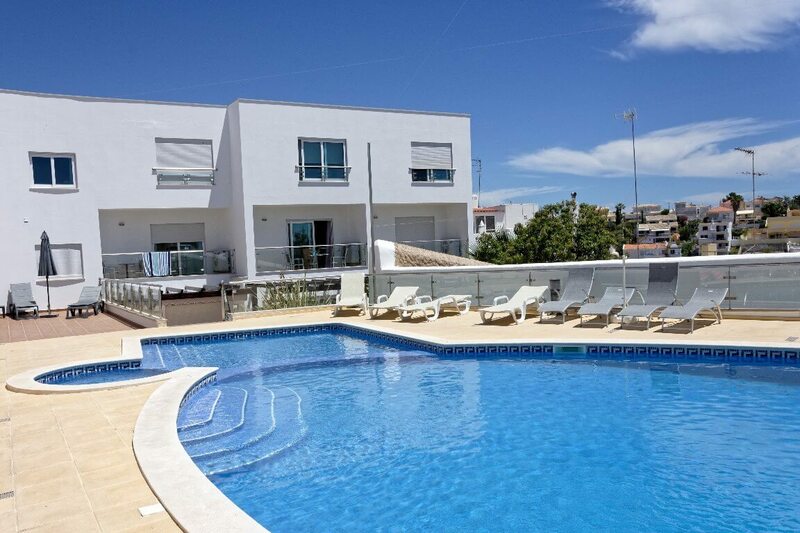 It was definetely one of the best places that my family stayed in Carvoeiro! Its been our summer holiday for the last 25years! Fantastic Apartment with everything we could have needed for our holiday! The hosts were fantastic.